The Lorax is different than Dr. Seuss’ other childrens stories. Like The Butter Batter Book, The Lorax took on a real life issue. In The Butter Batter Book‘s case, it had to do with the Cold War nuclear weapon stockpiling. 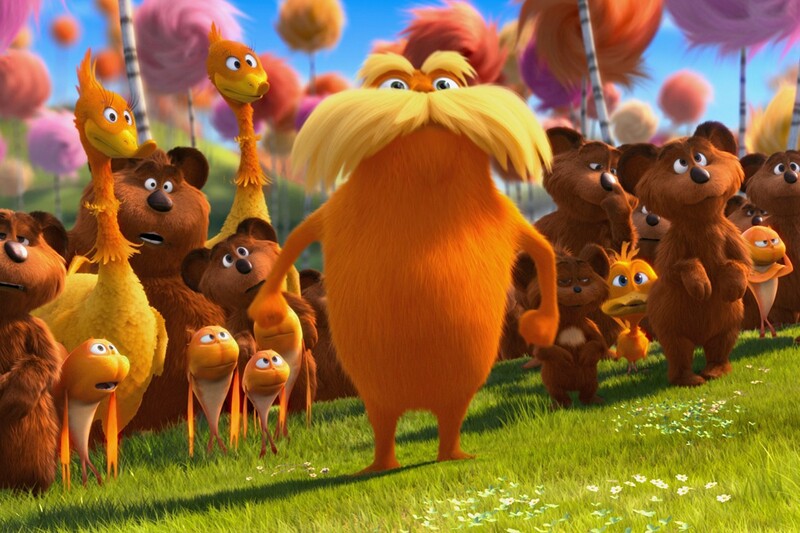 For The Lorax, it had to do with the enviorment, where the Lorax tried to save the Truffula Trees from the greedy Once-ler. The book starts off in a world devoid of nature, and Seuss forwarns that if industrialisation destroys nature, our future looks grim. Last week, Lou Dobbs of FOX Business declared The Lorax movie was “demonizing the 1% and espousing green energy policies.” It is true Dr. Seuss was a liberal, but Dobbs comparison just seems like FOX just blasting Hollywood again. Last year FOX Business also accused The Muppets of being against the 1% too because the villain was a wealthy oil tycoon who wanted to destroy the Muppet’s theater. From where I see it, Illumination and Universal have turned The Lorax into the opposite of Seus’ original message. The movie has made advertisements for Mazdas, pancakes, and diapers. It’s going the complete opposite of Seus’ book. This has generated controversy among movie critics. A. O. Scott of the New York Times called it “a noisy, useless piece of junk, reverse-engineered into something resembling popular art in accordance with the reigning imperatives of marketing and brand extension.” Adam Mazmanian of the Washington Post agreed, saying “the use of the character to promote sustainably manufactured products points to the essential hypocrisy and crude stupidity of the new film.” Stephen Colbert joked about The Lorax last Monday, saying it should automatically get Best Picture for 2013 because of all of its product tie-ins. It’s upsetting to realize how greedy the producers are to capitalize on a good that goes against it own name. But this didn’t hurt The Lorax. The film got over $70 million at the box office over the weekend, the highest opening for an animated movie since Toy Story 3. It saddens me to see this. Dr. Seuss must be rolling in his grave right now.